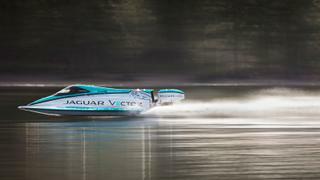 Jaguar Vector Racing has set a new world speed record for a battery-powered boat. Piloted by Jaguar Vector co-founder and technical director Peter Dredge, the boat recorded an average speed of 88.62mph across a one kilometre stretch of the historic Coniston Water in Cumbria, England, breaking the previous record of 76.8mph set in 2008. Developed with Formula E electric car technology, the Jaguar Vector V20E is powered by 320kg of batteries and a pair of Yasa electric motors, generating 295bhp. The boat was designed and constructed in partnerships with Jaguar Racing’s technical partner Williams Advanced Engineering. The team hope to break more world records over the next 18 months as part of a major initiative to push the boundaries of performance and to showcase British engineering. 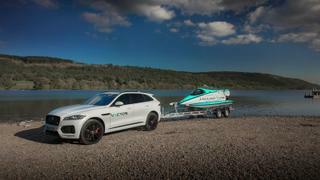 Malcolm Crease, CEO of Jaguar Vector Racing said, “After 12 months of hard work, this is a fantastic result for the team and our partners and a great first step in bringing the power and versatility of electrification to the marine industry.